When I meet patients or consult digitally with clients online one of the most important parts of their assessment is a review of their diet and recommendations to eliminate common food triggers of acne. 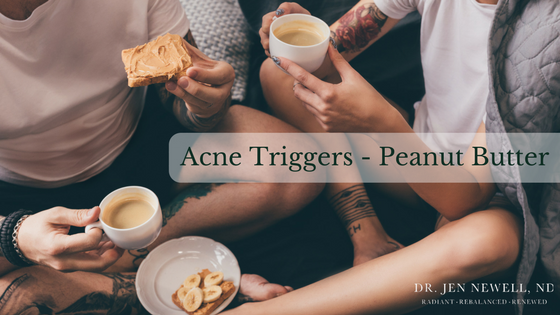 While everyone appears to have unique food sensitivities that result in inflammation and possible skin reactions, peanut butter is a commonly consumed food that can further promote the development of acne. I know this is going to disappoint many people, myself included. Peanut butter is one of my favourite foods so admitting that it affects and aggravates my skin was challenging; I resisted originally. Below are 5 ways peanut butter can lead to acne (don’t worry, I have included a few of my favourite peanut butter alternatives at the end of this post). Just 2 tablespoons of peanut butter has 16g of fat – 4.5g of which is polyunsaturated omega-6 fatty acids – and most of that omega-6 is LA (linoleic acid), which the body can convert to AA (arachidonic acid), which triggers inflammation. Now, omega-6 fatty acids are not necessarily unhealthy (they actually stimulate skin and hair growth and maintain bone health) but when you consume them in greater quantity than omega-3’s they become inflammatory. According to the University of Maryland Medical Center, the typical American diet contains 14-25 times more omega-6 fatty acids than omega-3s…The recommended ratio is 2:1 to 4:1 omega-6 to omega-3. Your body uses omega-6 fats to produce cytokines and prostaglandins, which start inflammation. If you have way too much omega-6 fat in your body (by eating foods like peanut butter), your body has trouble stopping inflammation. That’s because omega-3s are required to halt inflammation. Peanuts and peanut products (including peanut butter) contain a lectin known as peanut agluttinin. Lectins like peanut agluttinin are known to contribute to digestive upset and increase intestinal permeability – meaning it opens up the holes in your intestinal wall slightly, making it easier for food particles to pass through into your bloodstream and trigger an immune response. This impacts your skin because your skin and the health of your gut are so closely associated. Increased intestinal permeability/leaky gut contributes to the development autoimmune conditions, food allergies, and systemic inflammation. Providing food particles an opportunity to interact with the blood stream and your immune cells more directly compromises the functioning of the immune system, making it a lot more difficult for your body to fight the everyday infections, like clearing and healing clogged pores before they develop into full-blown inflamed pimples. Peanut butter is not just a problem for acne on it’s own, it is often paired with a pretty nasty little side kick – sugar. Most conventional peanut butter brands like Kraft, Skippy, etc. are loaded with processed sugars. Sugar is one of the worst foods for acne, leading to inflammation, glycation, clogged pores, excessive sebum production, and a compromised immune system. As blood sugars rise the pancreas responds by releasing insulin, a hormone that transports sugar into cells and reduces blood sugar levels. Insulin and insulin like growth factor 1 (IGF-1) increase the severity of acne and stimulate sebum production. While I am typically a fan of moderation in your approach to dietary modifications to reduce acne, if you have been struggling with persistent acne that has not been completely responsive, it may be worthwhile completely eliminating peanut butter from your diet as well as other common acne triggers like dairy, sugar, and vegetable oils. I also recommend focusing on consuming a greater quantity of foods rich in anti-inflammatory omega-3’s. Click here to learn more about how I help patients and digital clients overcome acne. Kris-etherton PM, Pearson TA, Wan Y, et al. High monounsaturated fatty acid diets lower plasma cholesterol and triacylglycerol concentrations. AM J Clin Nutr. 1999;70(6):1009-15.